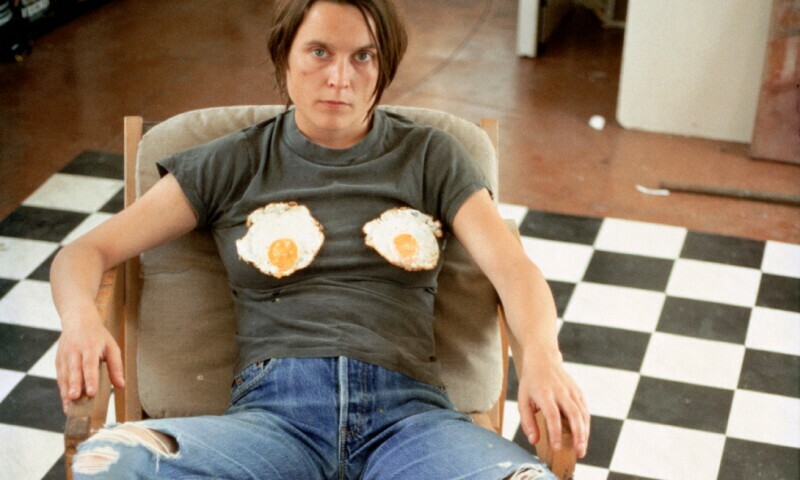 Sarah Lucas, Self-portrait with Fried Eggs, 1996. “Sarah Lucas: Au Naturel” will feature some of Lucas’s most important projects, including early sculptures from the 1990s that substitute domestic furniture for human body parts, and enlarged spreads from tabloid newspapers from the same period that reflect objectified representations of the female body. Alongside the photographic self-portraits that Lucas has produced throughout her career, the exhibition features biomorphic sculptures including her stuffed-stocking Bunnies(1997–ongoing) and NUDS (2009–ongoing), the Penetralia series (2008–ongoing), and selections from her installations at the Freud Museum in London (2000) and the British Pavilion at the Venice Biennale (2015). These works, which complicate inscribed codes of sexual and social normativity, have never been shown together in the United States. Lucas has also created new sculptural works for the exhibition, including This Jaguar’s Going to Heaven (2018), a severed 2003 Jaguar X-Type—the car’s back half burned and its front half collaged with cigarettes—and VOX POPDORIS (2018), a pair of eleven-foot-tall thigh-high platform boots cast in concrete.